Homeopathy is a medical therapy that uses natural animal, vegetal and mineral substances to support the innate regenerative healing powers of the human body. Homeopathy recognises the patient as a whole and considers both the individual’s physical and psychological aspects as well as the hereditary predisposition, environmental stress and toxins, nutrition, lifestyle. Where allopathic medicine merely suppresses symptoms, homeopathic medicines stimulate the patient immune system and work much more completely than those approaches which treat the disease or the symptom. The end result is strict individualisation of treatment. Homeopathy treats the person not the disease. The term “Homeopathy” comes from the Greek “homeos” = similar, alike and “pathos” = disease, suffering. The main law of Homeopathy is “like cures like”, known internationally as the “Law of Similars” : the same substance which in large amounts could cause a particular symptom to a healthy person, in homeopathic doses could cure the same symptom in a sick person. -coffee, consumed before bedtime causes insomnia, but in homeopathic doses induces sleep. -onion produces lacrymation and nasal discharge, but in homeopathic doses stops those symptoms. -vaccination also illustrates the Law of Similars: the patient is injected with a tiny dose of the germ to build immunity against the same germ. Homeopathy views the symptoms as signs of the body attempting to fight the illness and it is, in part, those symptoms that tell the homeopath which natural substances to prescribe avoiding the “heavy” assaults of drugs. To stimulate the body to cure a disease the homeopath must find the correct remedy. The homeopath takes the case in great detail and usually is able to select the precise remedy that match the totality of the patient. Homeopathy is a well established medical system. Hippocrates, the “Father of Medicine”, in the 5th century B.C., was the first to establish the principle of similarity. Dr. Samuel Hahnemann, a German physician, in 1790 discovered homeopathy and in 1796 he published his theories and experiments based on the “vital force”, the capacity of the individual’s reaction in response to illness, as well as the Law of Similars. Today homeopathy is based on scientific and medical data. More and more physicians (including the physician of the British Royal Family), veterinarians and dentists are prescribing homeopathic remedies in their daily practice, with an estimated 500 million people receiving homeopathic treatment in both curative and preventing medicine. Positive research studies on homeopathy have been published in prestigious medical journals such as Lancet and the British Journal of Clinical Pharmacology. Countries such as England and France embrace Homeopathy throughout their Health Care. Homeopathy is regulated under the Canadian Food and Drugs Act. 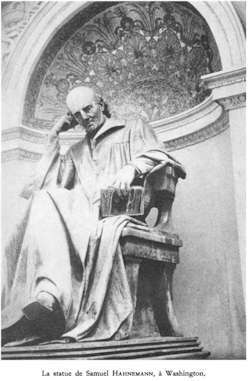 Hahnemann Monument in Washington, USA, created by Henry Niehaus in 1900, containing low reliefs that represent Hahnemann as a student, as a chemist, as a professor, and as a doctor. There are over 2000 homeopathic remedies. Any substance might potentially be used homeopathically, but most remedies are natural substances manufactured by specialised laboratories and are subject to strict regulations according to government standards and to the Homeopathic Pharmacopoeia of the United States and to the European Pharmacopoeia. The substance (derived from plant, mineral or animal) is macerated in order to obtain the mother tincture; from this, a drop is then diluted and potentized by vigorous shaking. This process of dynamization, as it is termed, will be repeated until the desired low (infinitesimal) dilution is obtained in order to enhance the remedy’s therapeutic effectiveness. Homeopathic remedies have varying strengths which are indicated by the number of times they are diluted. The higher the number, the stronger the medication. Homeopathic remedies can be produced into a variety of forms such as granules, globules (tiny granules) tablets, liquids, ointments, nasal sprays, suppositories. The granules, on which the medication is impregnated, are not to be touched but should be dispensed into the cap of the package or in a plastic spoon. Place under the tongue until the globules have dissolved (do not swallow or chew). By not handling the granule, you are assuring the purity of the medicine. Liquid formulas and drops: pour directly under the tongue or dilute in a plastic spoon with a few drops of water. Retain for a few minutes before swallowing. Oils and ointments are for external use only. For babies and young children, you can dissolve granules in a little water. The mouth should be clear of strong flavours: coffee, tobacco smoke, alcohol. Mint (toothpaste, chewing gum, cough drops, etc) must be avoided during the treatment. Avoid inhaling strong substances(detergents, perfumes). All remedies should be taken 20-30 minutes before a meal or 1 hour after a meal. Keep the remedies in a cool, dry and dark place away from strong smelling substances and they will remain effective for several years. Homeopathic remedies contain very, very small quantities of the substance called potencies, prepared in a special way. These high dilutions not only enhance their curative properties, but avoid undesirable side effects, adverse or toxic reactions, allergic response or addictions to the treatment. Homeopathy is completely safe and can be used for pregnant women, babies and children as well as elderly people. Can I get help ? Homeopathy is particularly effective in treating chronic illnesses that fail to respond to conventional treatment and is also a very good method of self - care for minor, mild and acute conditions such as the common cold and flu or injuries. It is also useful in dental treatment. Homeopathy can be used in conjonction with others therapies or medication without concern of interaction. If you suffer from headache, for example, the homeopath will want to know about the symptoms of your illness and what affects them, about your medical history, your appetite, likes and dislikes, in order to select the remedy that most closely matches the symptoms. Ten patients with headache could receive 10 different remedies. If the headache comes on suddenly, is intense and violent with throbbing, pulsating, burning pains (in the back of head, eye, forehead and temples), worse on right side, face is red hot, pupils are dilated, no thirst, the patient is anxious, restless, worse from noise, light, stooping, jarring motion, touch, between 3 pm -11 pm and better wrapping up head tightly, keeping perfectly still, sitting upright, then the remedy is Belladona. If the headache starts at back of the head and extends over head to forehead, over right eye, as a though tight band was around the head, the patient cannot be bothered with anything, is very tired, depressed but cannot cry, thirstless, with frequent urination of large amounts of urine which relieves the headache, is worse from movement, jarring, light and noise and better from sleeping with head on a high pillow, then the remedy is Gelsemium. When the remedy is correct the patient will feel much better; not only the headache but the general health condition will improve. Patients often remark that they haven’t felt so well in a long time. The advantage of homeopathy is its ability to deal with symptoms for which no medical reason (diagnostic) can yet be found. Homeopathy is highly effective in various illnesses. Disclaimer: This information is not intended to replace the diagnosis, treatment and services of a physician. Any recommendations and indications are at user's discretion. For medical conditions always seek immediate medical attention.